Who should go - who should not? 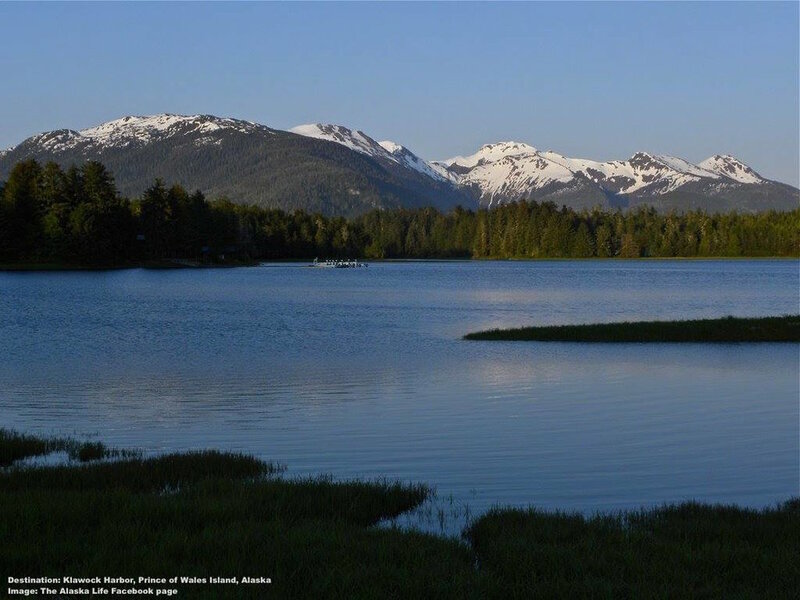 Insider tips on climate, temperature, best wildlife viewing time, packing for the temperate rainforest, tips for foreign guests and more are included. It is easier to relax and have a great time when you are well prepared. Read below for tips on when to go, the climate, who is most likely to love a Prince of Wales vacation, hints on what to pack, what our foreign guests might need to know, health tips, and how to get there. Bears: Bears and wolves can be sighted from April until they begin to hibernate in December. 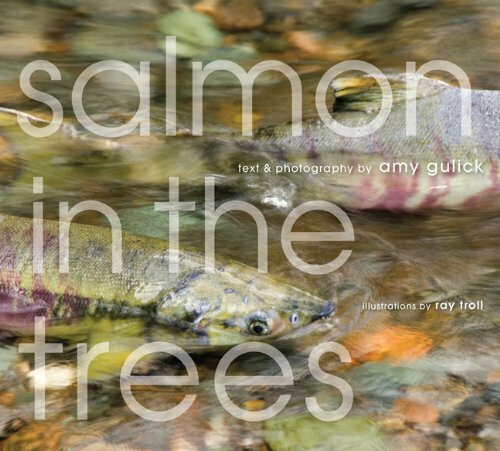 They are easiest to see from July through September - when the salmon are running. Late April through July is the best time to see young cubs. Wolves: Wolves are active all year, but very difficult to see at any time. The salmon run from July through September presents the best opportunity. The wolves are more active along the streams during this period. Marine Life: Humpback whales and orca are seen in the waters around Prince of Wales Island from April through September. Dolphins and porpoises arrive a little later; they can usually be seen from June until September. Bird Watching: Eagles are active on the island year-round. Sandhill cranes and blue herons can be seen over the entire island in spring. Swans, geese, and many varieties of ducks overwinter here; they can be seen from October through March. A variety of other birds, many quite rare, migrate through the Tongass National Forest each spring. The maritime (ocean-influenced) climate of Prince of Wales Island is cool and moist most of the year. Winter temperatures usually range between 30F to 50F (0C - 10C); although "cold snaps" with temperatures in the high teens (-10C) happen occasionally. Summer temperatures usually range between 45F and 65F (7C - 18C), with occasional spikes into the mid-80's (29C). Prince of Wales Island is centrally located in the planet's largest temperate rainforest - and they call it a rainforest for a reason. Between 60 and 220 inches (150cm to 560cm) of rain fall on Prince of Wales Island each year. November is usually the wettest month, and July is usually the driest, but significant rainfall can occur at any time. Due to its northern latitude, Prince of Wales Island gets up to 17 hours of daylight in summer and as little as 5 in the winter. Who Should Go - Who Should Not ? On Prince of Wales Island fun, responsible activities run the gamut from strenuous hikes and primitive camping to accessible walks and viewing stations for wildlife watching. This is a destination (almost) every nature lover can enjoy. THE RAINFOREST IS FULL OF SURPRISES, LIKE THIS COLORFUL, EDIBLE FUNGUS CALLED, "CHICKEN OF THE WOODS" IMAGE: THANKS TO LUKE. ...you enjoy The Road Less Traveled! We will soon offer organized tours. For now you are in control of your itinerary, reach out, we will help you. ...you want to experience nature as much as see wildlife. This Island is about old-growth rainforest and unspoiled beaches as well as bears. ...you like a challenge. See whales, eagles, puffins, bears, and maybe wolves on one trip? Possible with the rich ocean / rainforest ecosystems. ...you want to meet the locals. Your inn is someone's home, the whale watching boat captain and cafe cook are his neighbors. Your visit here makes a difference. ...you are looking for luxury. Most accommodations on Prince of Wales Island range from simple inns to primitive cabins. No five-star hotels or Michelin-rated restaurants. ...you do not want to drive. This the third largest island in the United States, and there is no public transportation. ...you hate rain. It is not unusual for the island to see three times as much rain as Seattle. ...you only care about mega-fauna. This is not like Yellowstone the black bear and wild wolves here are more elusive, time and patience is the key! Children: The casual, family oriented atmosphere, including accommodations with kitchenettes, and lots of opportunity for outdoor exploring makes Prince of Wales Island a wonderful place for a multi-generational vacation, but best for children over 10-years old. Accessibility Some wildlife viewing sites, including some of the fish passes, great for black bear and eagle watching, are wheelchair accessible. Some of the raised boardwalk trails through the rainforest, and along the coast line (whale watching!) are also accessible. See: Things to Do for more. English is the primary language spoken in all of the U.S states including Alaska, although you may be fortunate enough to also hear the Haida language or even Tlingit in some of the Island's communities. The United States requires a Visa for foreign national visitors from specific countries. Please check here for requirements. Most citizens of countries participating in the waiver program may travel to the United States for short visits without a visa. Citizens of Canada and Bermuda do not need visas, please check here for additional information and requirements. Mosquitos: There are mosquitos, but no malaria or Zika virus carrying mosquitos on Prince of Wales Island. Bring and use mosquito repellant. 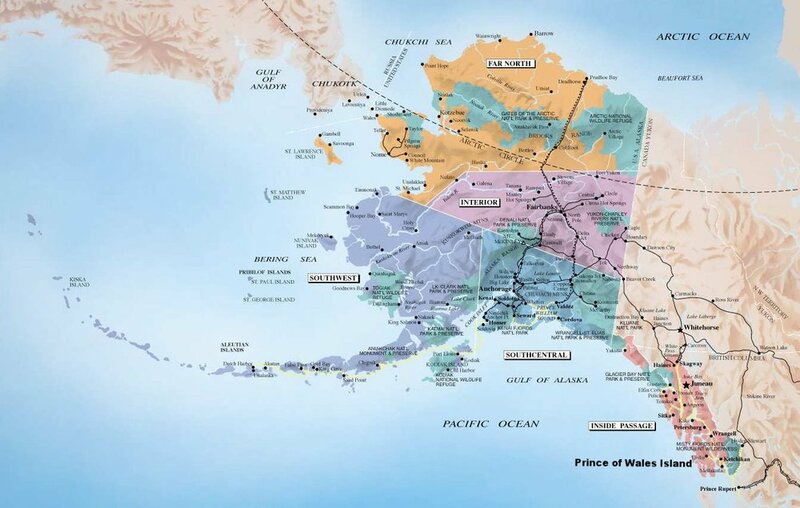 PRINCE OF WALES ISLAND IS AT THE SOUTHERN MOST TIP OF THE STATE, IT IS PART OF THE INSIDE PASSAGE, THE "GATEWAY TO ALASKA"
Seattle Tacoma International Airport: The easiest gateway for most travelers, either international or from the U.S., is Seattle. Seattle Tacoma International Airport, affectionately known by the locals as "Sea Tac", serves 24 airlines, including a wide selection of international carriers. Alaska Airlines offers direct flights from Seattle to Ketchikan, Alaska, which is the closest airport to Prince of Wales Island. The Road Less Traveled: If you have the time, the ferry trip up the Inside Passage to Ketchikan is a wonderful adventure in itself. Take an Airporter Shuttle from Sea Tac to the Bellingham Cruise Terminal; the shuttle takes a little less than three hours. Then catch one of the Alaska Marine Highway System ferries to Ketchikan. Ferries depart every Friday, and you can walk on or take your motorcycle, car, or even RV. There are 2- to 4-bunk cabins with ensuite heads (bathrooms), or you can sleep in your car, or you can camp on deck. The 36-hour trip passes close to incredible coastlines and dense forests with mountains in the background and often marine life right next to the ferry. Juneau International Airport: Juneau serves only two major carriers, Alaska Airlines and Delta Airlines, and Delta is active only during the summer months. Nevertheless, if you are already in Alaska, Juneau many serve as a gateway. Alaska Airlines flies regularly to Ketchikan, and Delta also has limited flights during the summer. THE INTERISLAND FERRY IS A RELAXING AND BEAUTIFUL WAY TO ARRIVE AT PRINCE OF WALES ISLAND. YOUR WELCOMING COMMITTEE MIGHT INCLUDE HUMPBACK WHALE, WHITE SIDED PORPOISE, HARBOR SEAL, BALD EAGLES, GULLS AND MANY OTHERS. IMAGE; THANKS TO ©JFIMAGES. Arrival in Ketchikan: Once you arrive in Ketchikan, you have two choices to get to Prince of Wales Island: take the Inter-Island Ferry on a 3-hour cross-channel ride into the former mining and timber town of Hollis or book a flight on a local carrier into one of the small towns on the island. The advantage of the ferry is that you can rent a car in Ketchikan and take it on the ferry to the island. On the other hand, how often to you get to fly in a small airplane at low altitudes over pristine wilderness? For more information on local flights, see Prince of Wales Chamber of Commerce. See "Prince of Wales Island: Logistics" for additional details on getting to the island from Ketchikan. 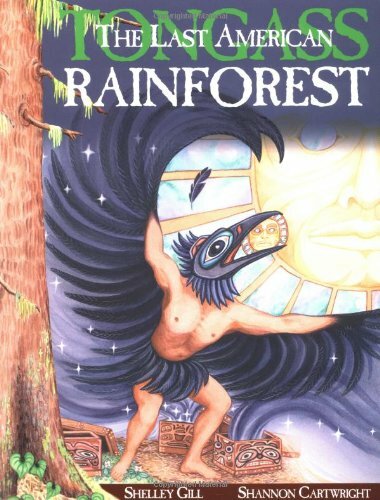 HIGH RUBBER OR NEOPRENE BOOTS ARE A MUST FOR COMFORTABLE EXPLORING OF THIS TEMPERATE RAINFOREST! You know how to pack, but every destination has its own quirks, a temperate rainforest is no different! Here are some Best Practice packing hints for comfortable exploring on Prince of Wales Island. Rubber or Neoprene Boots! Calf high, with a liner or heavy socks for temperature control. Locals use them for both the trails and the beaches. Hiking boots: Waterproof, preferably with a waterproof-breathable liner. Designs that are easy to clean are best; they will get muddy. Best Practice: Never wear new boots while hiking, break them in completely first. Fleece layers: Compared to many wilderness areas, Prince of Wales Island is quite mild, but the dampness and high humidity make it easy to get chilled. Fleece is better than most materials at retaining warmth when damp or wet. Raingear: Waterproof breathable fabrics are best, make sure it has a hood or bring a waterproof hat. Rain trousers or bibs are also recommended if your plans call for hiking or camping. Extra socks: As per our hiking friend from the Forestry Department. Backpack: Even if you are only planning short walks, carry a lightweight backpack. See the backpack supplies list below. Bug spray: Mosquitos and flies are part of the scene. Bring and use repellent when hiking or exploring. Most folks recommend a DEET-type spray. Camera protection: Bring wet weather protection for your camera and any other electronics you plan to carry outdoors. Outdoor stores and photography shops usually carry a selection of weather protection options. Bug Repellant Clothing: Some clothing made for outdoor use incorporates bug protection, not a bad idea for the rainforest. In the same vein, a net head covering may be an option if you are opposed to chemical insect repellents. Water: In a reusable container. It is a rainforest, so there are plenty of clear streams; bring a backpacking water filter if you plan on relying on them for water. Extra layers: fleece and rainproof outer wear, extra socks. Map, compass: The GPS on your phone may not work in the forest. Get a detailed topographical map from the Forestry Service. Hint: Learn how to read both before you get on the trail. Food: Extra food. Not just that picnic you planned, bring additional energy bars, nuts, etc. Hint: repackage food into resealable plastic bags. They lighten the load and may come in handy on the trail. Plastic garbage bag, large, black type: Fold it and hold it. In emergencies it has many uses including shelter. Toilet Paper: Hint: Try the more versatile sanitary wipes. First rule: Don’t pack what you don’t know how to use. The kit should include: Adhesive bandages (various sizes), medical or duct tape, moleskin, sterile gauze, ibuprofen, Benadryl, antibiotic ointment, alcohol wipes, and any medications you usually take on a daily basis. The kit can also include scissors and an ace bandage. for their time, help, and enthusiasm for this very special place. COME TO PRINCE OF WHALES ISLAND, THE HUMPBACKS ARE WAITING TO GREET YOU. IMAGE: THANKS TO ©IAN A. JOHNSON AND LIFE, WILDLIFE, AND WILD-LIFE.